Manufacturer: Hamelin Brands distributed by Mead in the U.S. Availability: You can find these notebooks at almost all of the major office supply stores, including Staples and Office Depot, and even at some drugstores like Rite-Aid. Online Retailers: This page on their website shows many of the companies that stock their products. Others include Amazon, Office max, and Mead's website. I use these notebooks almost everyday for my classes and have gone through several, so I feel qualified to write an extensive, unbiased review about them. When I first bought one of these notebooks, I was looking at Office Depot for paper. I found these and fell in love with the way they looked, so I bought two of them. To my surprise, the paper was just as smooth as Clairefontaine, if not smoother. At only two dollars more than the Clairefontaine notebooks (I'll review one of those eventually), you get stiffer, thicker covers which are better to use as a writing surface and twenty more sheets of paper. Writing on this paper for the first time is an astounding experience. Even the scratchiest nibs (including cheap Cross and Chinese pens) instantly become as smooth as much nicer gold ones. In addition to this, wonderful nibs become even greater and display shading fantastically. It's easily comparable to Rhodia, Clairefontaine, Field Notes, and other well-respected brands. Black n' Red paper does have one very unique advantage (or problem for some people) over its competition: it somehow makes all line widths appear finer than on any other paper. Writing with Levenger Cobalt Blue on any other paper, I would say that my Lamy Safari with a fine nib is a medium or even a broad. On this paper, it's drastically finer with no increase in feedback. Lovers of German broad nibs will most likely loathe this, but I love it as it allows me to use my German mediums and broads more often for note taking. In this thread on FPN, several people discuss the change in line width. As with all high-quality paper, drying times skyrocket by 50% to 100% (the difference between 15 seconds and 30 seconds) while writing on it. The reason for this is that low-quality paper is usually more absorbent, meaning that it draws in the ink faster and drying times decrease, whereas high-quality paper is usually far less absorbent and repels ink, increasing drying times. As this is the case with almost all high-quality paper, I do not find fault with this at all. What I do dislike about his paper is that approximately every ten pages (about 14 pages in this notebook), you'll encounter a page which is so resistant to ink that drying times become laughable. One page in my notebook refused to dry for several weeks, ruining the notes I had taken on it. Knowing this, I now check drying times with the first few sentences, and if they're higher than usual I'll move on to the next page. After going through several of these notebooks, this procedure has saved at least 50 pages from smearing and becoming unreadable. The paper in a notebook could be the greatest in the world, but it wouldn't be suitable for my use if the covers weren't thick enough or the binding came apart easily. Thankfully, this notebook has fantastic covers. Both are thick and stiff- great to use as impromptu writing surfaces. The binding is also strong, and pages don't fall out unless you apply a great amount of force. A slight complaint I have about the covers is that the inside pocket is not wide enough to hold most paper I use as a student, meaning that I have to carry more folders with me. This won't affect you if you'll be using them at home, but it's bothersome to open a separate folder to store a handout quickly. 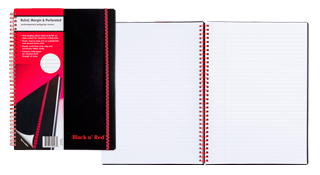 I can confidently say that these notebooks are the most widely available notebooks of their quality. Similar notebooks like the Rhodia Meeting Book and Clairefontaine notebook are hard to find aside from stationery stores and online retailers. You can walk into your nearest office supply store, and you'll have a high chance of finding them. They're even available at Rite-Aid of all places. One slight drawback of the wide availability is that I find self buying these notebooks often. When you can just walk into a store with hundreds of locations and buy a product, there's very little holding you back from doing so. The scans are color-accurate on my screen, but you may have to adjust your monitor. This paper is very good with shading and practically eliminates feathering, show through, and bleed through. If you compare writing on this paper to writing on copier paper or even Levenger and other high-quality paper, you'll notice what I mentioned earlier about nibs seeming finer. For comparison, here are two writing samples on different papers which clearly show the effect Black n' Red paper has on line width. There is very minimal bleed through except for the words written with Levenger Cobalt Blue. I have a separate review for that ink, and it performs that way on all paper. Show through is non-existent in real life but becomes much more apparent in scans. Occasionally, I would encounter a page which would refuse to dry. Even after several days, the writing would still be wet. Thankfully, this occurs rarely, and when it does you can quickly switch to the next page. The pocket on the general information page isn't wide enough to hold most papers. Great post. It is important to be guided when writing any kind of term papers. Nice post keep sharing always in future also.